50%-50% KING size bed pillow 36" x 20"
These are really KING size pillows! These beautifully crafted pillows are sold with a Quilted cover INCLUDED !! The case is 100% cotton with a divided interior to keep the hulls seperate. Also, has a beautiful Smooth Nylon Zipper. The triple layer quilted cover is soft and smooth. 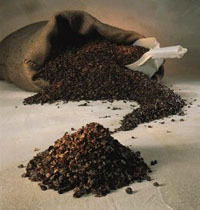 Filled with premium grade A+, triple cleaned, organic buckwheat hulls and premium grade A+ triple cleaned Millet Hulls. Color - Case = Natural off white and the Quilted cover is white. Uses King size department store pillow cases! $89.95 for 1pillow + $84.95 for each additional KING pillow. FREE shipping! The price you see is the price you pay ! 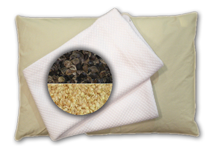 50%-50% QUEEN size bed pillow 30" x 20"
These are really QUEEN size pillows! Uses Queen size department store pillow cases! $79.95 for 1pillow + $74.95 for each additional QUEEN pillow. 50%-50% STANDARD / TWIN size bed pillow 26" x 20"
These are really STANDARD / TWIN size pillows! Uses Standard size department store pillow cases! $74.95 for 1pillow + $69.95 for each additional STANDARD pillow. 50%-50% JAPANESE size bed pillow 20" x 14"
These are really authentic Japanese size pillows! $49.95 for 1pillow + $44.95 for each additional JAPANESE pillow. 50%-50% TRAVEL size bed pillow 16" x 11"
These are really Travel size pillows! $44.95 for 1pillow + $39.95 for each additional TRAVEL pillow. BUCKWHEAT HULLS by the pound. Premium grade A+, triple cleaned, organic buckwheat hulls. Grips together under body weight, providing cozy, stable, passive support. Cool with constant ventilation, hulls allow for fresh air to circulate throughout the pillow. Traditional pillow filling used for centuries in Asia. Used to relieve headaches, neck pain, lower back pain, muscle tension, stress, sleeplessness and snoring. SALE PRICE! Includes FREE shipping! $14.95 for 1pound + $4.95 for each additional pound. Wait ! It gets even better - Check these SUPER SPECIALS!